Fireproof DVD by Provident is published by Provident and is our 302nd best seller. 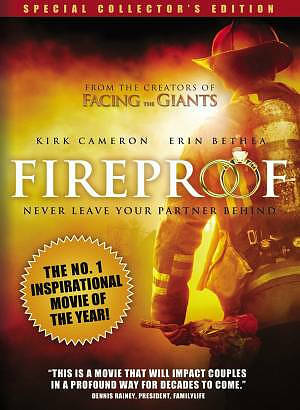 The ISBN for Fireproof DVD is 0602341003391. This is an action packed film which has a few twists as it goes along. A film which both men and women will get something from. Married or single there is lots you can gain from watching this film. I have only watch it once, but will have to watch it again. I believe each time you see the film you will get something new from it. It is well made movie which took 30days to film. I thought initially the concept was going to be somewhat cheesy, and certainly the opening few lines of acting felt like it, but the plot soon warmed up, and I was hooked by the middle of it, and I'm widowed!! I found the Love Dare concept superb, but did wonder how the husband could change his stance so readily in some respects, however, once you ignore some of those types of questions, you'll find it hugely enjoyable, with a LOT of smart lessons to be learnt and a couple of surprising twists. Personally for me, the dad made it all worth watching - the type of father figure we'd all love to have :). Very family friendly. This is a fantastic film, the story is so touching and amazing and you can relate to this if you have the same problems... It is a touching movie and the fact that their is a bigger meaning in the movie makes it more satisfiying to watch! The whole family enjoyed this film, as we did 'facing the giants'. It even brought a tear to the eye! This film will 'talk' to anyone experiencing or has ever experienced trials in their marriage...The acting is definitely improving in the Christian film making industry. Recommended for both family (and I think perfect for a 'married's film night') viewing session. I totally loved it! Lots of tears and lots of laughs! Will be watching it again this weekend! One of the best movies for people in a marriage crisis. Even though the only actor is Kirk Cameron, the movie is great. You can go down to your local church and gain help, or buy this movie. Got a question? No problem! Just click here to ask us about Fireproof DVD. How long is this film? A:The running time of this film is approximately 120 minutes. What lanugauges are included on the Fireproof DVD? Does it have Chinese subtitles? 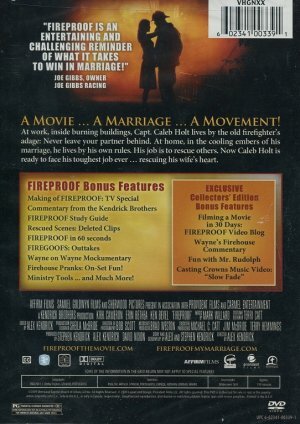 A:The Fireproof DVD has Chinese, English, French, Spanish Portuguese, Russian, Arabic and Korean subtitles. I am interested in buying copies of this DVD but I need them to be region 2. Can you confirm that the dvd's you have are region 2 please? A:This DVD is encoded for Region 0 & Region 2 meaning that it will play on a Region 2 DVD player. Unless otherwise stated all DVDs on Eden.co.uk will play on a Region 2 DVD player. Will the Fireproof DVD play on my region 2 player? A:Yes - the Fireproof DVD can be played in a UK DVD player. The DVD is actually Region 0 & Region 2. Region 0 indicates that the DVD can be played in DVD playesr worldwide. Region 2 indicates it can be played in the UK and Europe.